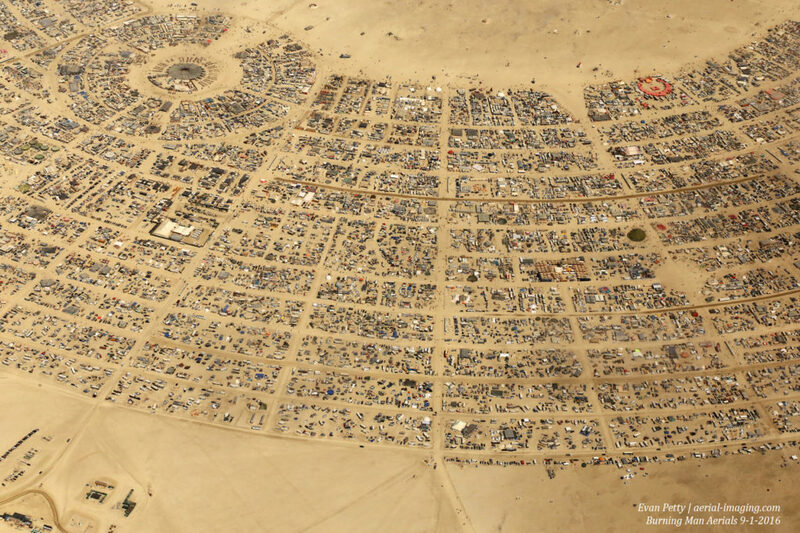 Earlier this month I insisted on flying to Burning Man for the sole purpose of seeing Black Rock City from 3,000 feet. 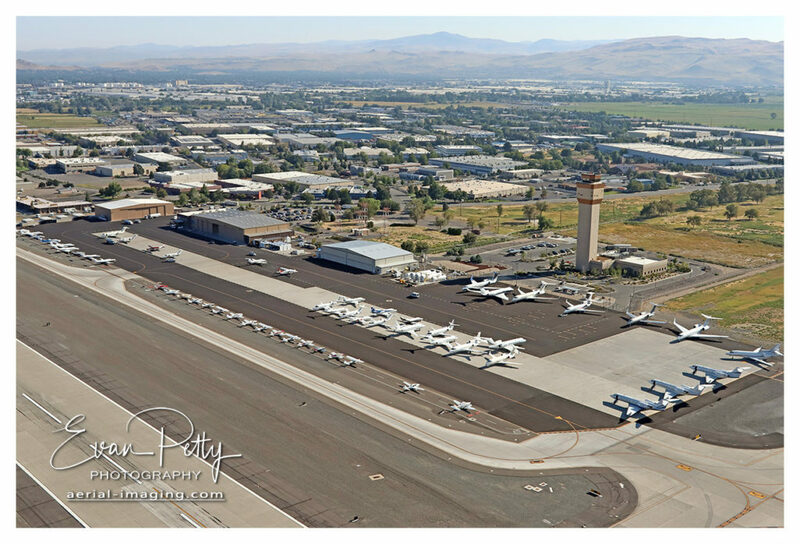 As we refueled in Winnemucca airport (I was staring at the posters on the FBO wall and eating a snack) I had a spontaneous thought, fly to Black Rock City instead of going just straight to Reno. After all, Black Rock City is about 60% of the way back to Reno and why not today? I had intended on flying over Burning Man many times over the past 10 years or so and today was well, perfect. Only I had not asked the pilot just yet. When I let the cat out of the bag, he rolled his eyes and reminded me this crazy idea requires planning and something called coordination. After reminding him that I am hands down the most prepared and organized aerial photographer he has ever flown (ahem), I declared it was time we did something spontaneous. After all, I reminded him that he has landed at Black Rock City several times and knows the regulations of the airspace above BRC. After a few minutes of pleading, he finally agreed. I had no intention of landing, just capture the view from the air of 40,000 people preparing for tonight’s festivities. But even more interesting (to me) is how does it look from the air as art installations are created and people prepare during the day for tonight’s fun – but from up high. I have seen satellite shots, and low level drone shots here, but how about aerials views that show the entire BRC before the burn? Besides, I have an anthropomorphic fascination with views of life from way above. Say several thousand feet above people, etc. Sounds fun …let’s do it! Well the challenges started almost 10 miles before we arrived at Black Rock City. As we approached the dust became thicker, even up high. Playa dust can soar thousands of feet, and the wind today appeared to be doing all it could to prevent aerial shots. Additionally, arriving planes arrive here for one purpose usually – to deliver supplies or people with the intention of landing. We were not. We were there to view and take pictures only and then head to Reno. The very few planes that do not land (like us) will fly over the city in an orbit (called a pattern) which requires only right turns around Black Rock City …at 2,000ft. Since our Cessna was only prepared to shoot out of the left side today, this requires left turn orbits. We decided to try anyway, by staying more than 2,000 feet above and away from all other airplanes. And of course now our altitude at 4000ft was higher than I had hoped. We also seemed to inherit all the wind and unstable air at this new altitude. This is when a super-fast-over-the-top shutter speed comes in handy. So with my cameras, big lenses and polarizing filters we jumped in a counter-clockwise pattern and voila! The playa dust and wind cooperated for the last few moments over the City. We succeeded and managed to do a few aerial shots by completing only 1 partial orbit above Black Rock City. Thankfully my experience handling construction aerial work in busy metro areas (Phoenix and Las Vegas) has trained me well to get the shots in one orbit. For this part, I was prepared. 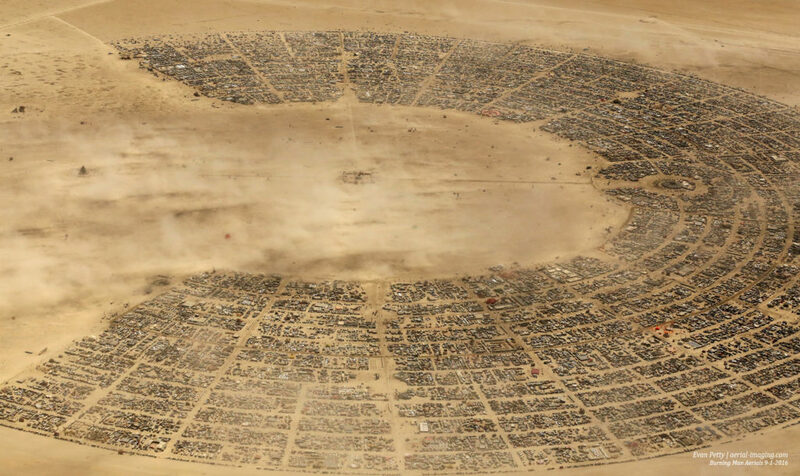 Black Rock City looks absolutely surreal from the air. If I had more time (and able to do right turn orbits), I would have focused on “The Man” being constructed in preparation for his weekend burn. You can see the art sets and structures in good detail. For the 15 minutes I had overhead, BRC seemed like a movie set for an enormous epic movie set in Egypt, or even a Star Wars set. Hollywood take note, there is a grand opportunity should you need 40,000 extras. 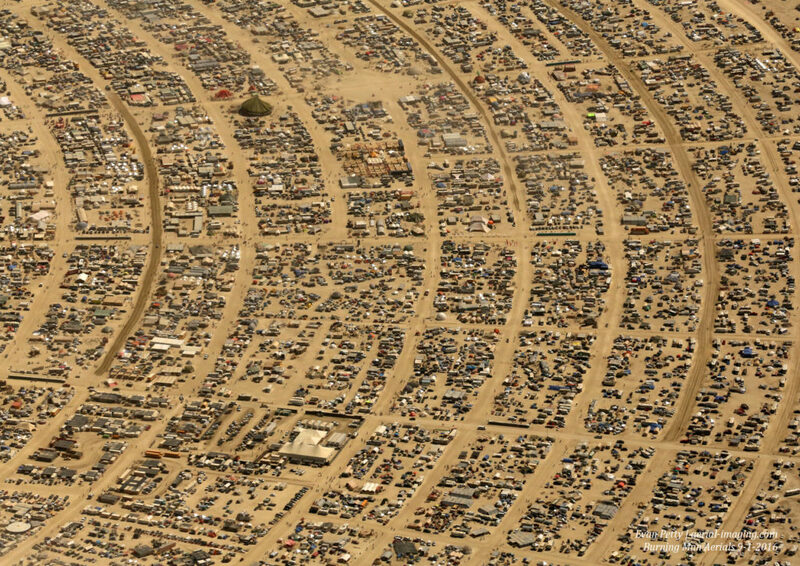 Perhaps next year I will plan on just that, 40,000 extras to help me with some aerial shots above Black Rock City. I still need to work out how to do that part still.